We all have questions, but as Christians we are commanded to be ready to give a defence for our faith, as well. This exciting new series of apologetics Pocket Guides will help you effectively deal with the critical questions facing our culture today. Here you will find concise, illustrated text . . . so you will always be equipped with solid answers! One each of all nineteen pocket guides. Can't we just add evolution to the Bible? Were the days of creation really long ages? These and other questions are answered in this Pocket Guide to Compromise. Have you ever heard an argument that just didn't seem right to you? Do you want to be equipped to defend your faith logically? In this Pocket Guide to Logic & Faith, Dr. Jason Lisle exposes logical fallacies that evolutionists often use to argue their case. How does the human body react to emergencies? How is the brain better than any supercomputer? These and other questions are answered in this Pocket Guide to the Human Body. Experts in the fields of paleontology, anatomy, genetics, and ancient Bible texts examine both the scientific evidence and the biblical record. They show that humans are not related to apes, but were specially created by God in His image. 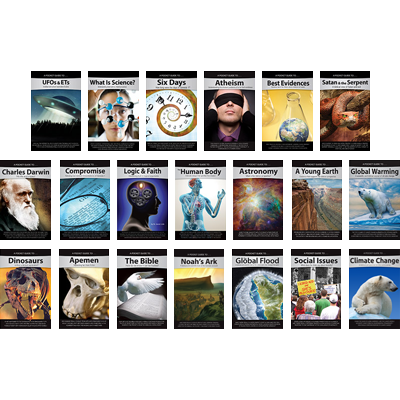 This pocket guide examines the age of the earth from a biblical and scientific perspective. It presents exciting geological information rarely noted in public schools, and will equip you with answers that are solidly based on the authority of Bible. Museums, media, and schools all proclaim that dinosaurs died millions of years ago. They also teach that the birds in your backyard are actually descendants of dinosaurs. But what is the truth? Only when we start with the Bible can we understand the true history of dinosaurs. Here are well-researched, down-to-earth answers to questions about Darwin’s life and legacy. How did he come to believe in evolution? Has evolution been proven true? 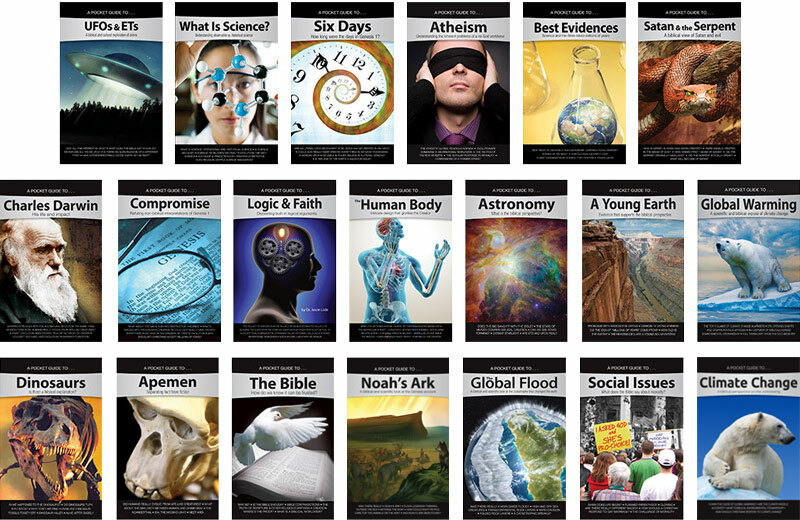 This guide will show you why you can’t just add evolution to the Bible. Can we believe the Bible’s account of Noah’s Ark? How could it hold all those animals? How could Noah care for all of them? Answer these and more with this biblical and scientific look at the Genesis account of Noah and his obedience. What does the Bible have to say about morality for today? What about stem cells, homosexuality, euthanasia, and racism? Huge social questions abound in today’s culture. Get answers based on the authority of God’s Word! The Bible claims to be the Word of God and to be sufficient for understanding the world in which we live. But how do we know it can be trusted? Why 66 books? Is the Bible enough? Are there contradictions? It’s written by the Creator, so we can put our trust in it! Here is a biblical and scientific look at the catastrophe that changed the earth. Be equipped with concise, powerful, illustrated answers to questions regarding transcontinental rock layers, rapid erosion, folded rock layers, and more. Global warming is real, but is it primarily man-made? Designed as a quick reference pocket guide, the message of this layman-friendly book is urgently needed in America and the world.